Kenyan police have charged the world's 3,000m steeplechase champion, Ezekiel Kemboi, with assault after a woman said he stabbed her on Wednesday night. Anne Njeri Otieno alleges that the athlete attacked her when she declined his sexual advances. 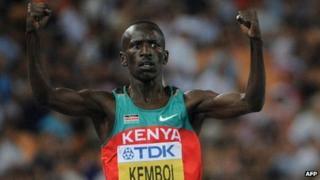 Mr Kemboi denied the allegations, saying she colluded with thugs to rob him and was injured in the skirmish. The magistrate granted the athlete bail and said he would be allowed to travel to London to compete in the Olympics. Mr Kemboi, a serving policeman, was charged at the Eldoret law courts with assaulting Ms Otieno and released on bail of $595 (£385). He is due back in court in September. "I am already in the team for the London Olympic Games. I would like your honour to give me time to take part in the competition," the AFP news agency quotes him as saying. The BBC's Wanyama Chebusiri in Eldoret says Mr Kemboi spent several hours at the town's police station being questioned on Thursday. The station was jammed with hundreds of curious onlookers, and officers had difficulty controlling the swelling crowd, he says. Earlier Ms Otieno, who is in a stable condition in hospital, told reporters that she had been out drinking with Mr Kemboi and requested that he give her a lift home. She said when they arrived at the house they fought for several minutes and then Mr Kemboi went to the car to get a dagger and stabbed her. But the 2004 Olympic gold 3,000m steeplechase winner told police that the attackers drove up in a red car and demanded money from him. "One of them aimed the knife at me but fortunately it missed me and stabbed one of the thugs in the chest," he said. As it was dark Mr Kemboi said he was unable to see the car's number plate. "I have left everything with the police," he said.